My husband recently built himself a 3D printer. He bought the printer with making spare and custom parts for his model aircraft hobby in mind, but he thoroughly enjoys printing anything. 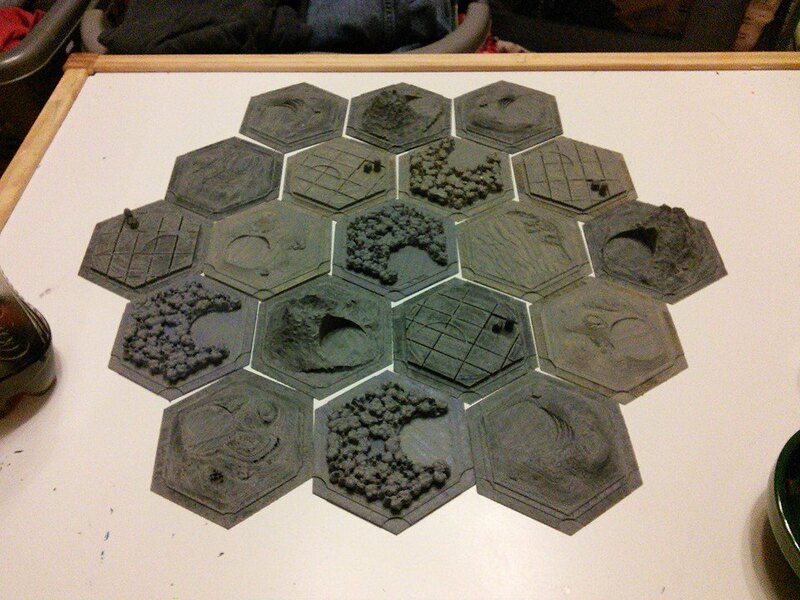 While browsing Thingiverse for ideas he came across a full set of 3D Catan tiles. When he showed me the patterns I suddenly became a lot more interested in his printer which I had (up to that point in time) been indifferent to or annoyed by and I asked him to print me a set so that I could awesomeify them. 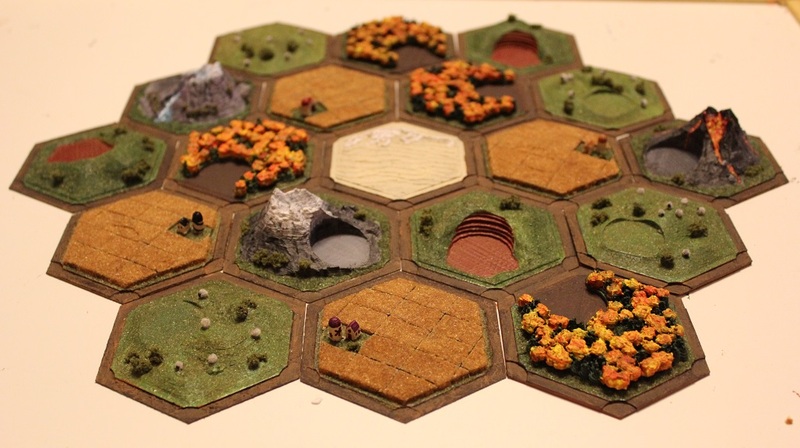 Before I go any further I’d just like to say that I own a Settlers of Catan game that I paid for, and I made this custom board for my own personal use. All of the game pieces and cards are still required to actually play with it. 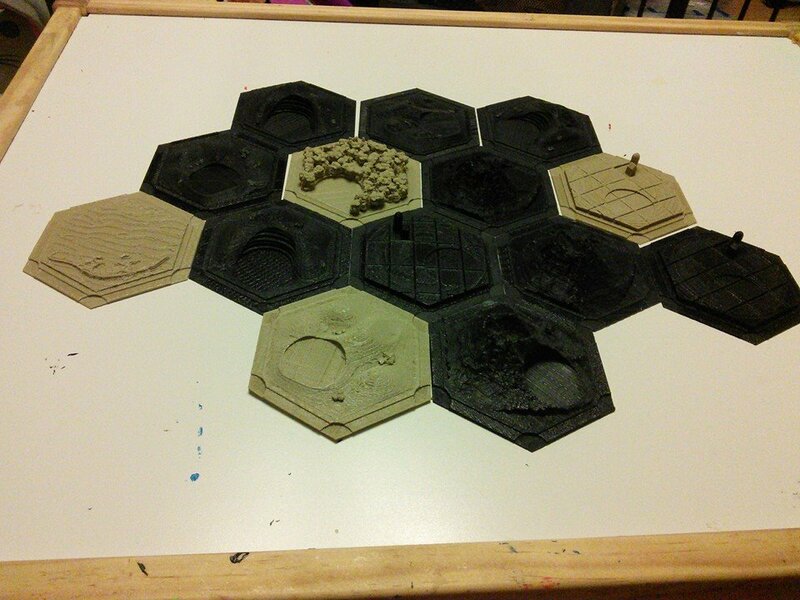 Including the printing, the creation of the full tile set took probably a good 50-60 hours to complete. Below I’ve provided a bunch of close up photos and descriptions of the materials I used as well as how I customized each tile. If you have any technical queries about the printer just drop a comment at the bottom of the page and I’ll get my husband to answer them for you. Each tile took about an hour on average to complete. There were a lot of print failures due to crummy plastic and with life getting in the way all the time it took about a week to get the full set of 19 tiles printed. After the pieces were printed they needed a lot of clean up because 3D printers leave spider webs of plastic strings everywhere as the nozzle moves around the print to build up all of the layers. I have a great pair of cuticle trimmers that I used to snip all of the delicate strings without damaging the prints unintentionally. I couldn’t bring myself to start painting until I had it all in front of me because I tend to rotate through tasks so that as one thing is drying I’m working on something else and my brain doesn’t let me concentrate on the one thing until I know that I can act on the next idea that pops into my head. We all have our little neurosis. Once the excess plastic was trimmed away I primed all of the pieces with a wash of grey acrylic paint and water. The purpose of priming is to give the next layers of paint something to stick to and so that everything is uniform in color. Then, I got into customizing the tiles. I’ll cover the wheat fields first. Originally I was going to make the wheat fields all patchworked with different shades of brown and green but ultimately I decided that it’s wheat so I made it look wheaty. 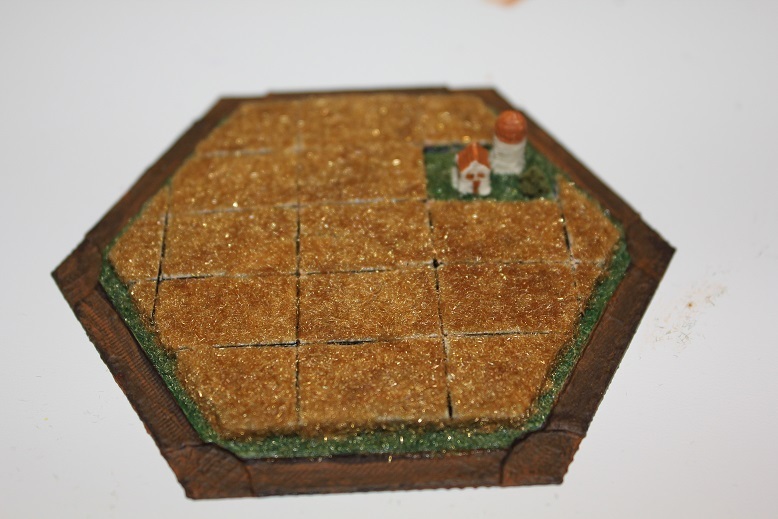 I painted the base colors in acrylic, so brown for the road on the outside of the tile, green for the grassy bits and light beige for under the wheat. 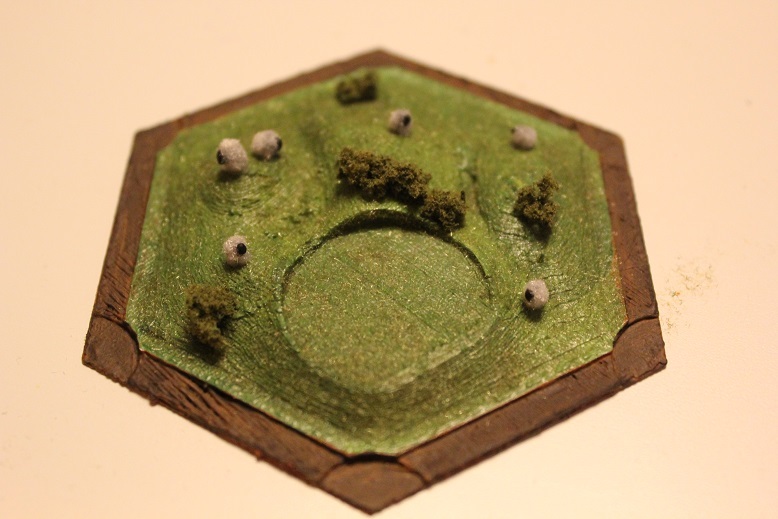 Next I put a layer of PVA glue on top of the dried green areas and applied green flock to them to make grass. The flock that I used is actually stuff that was marketed for nail art because apparently furry nails are in right now. At any rate, it was really inexpensive and absolutely perfect for what I needed it to do. After the green areas had completely dried I applied a dry brush loaded with a lighter shade of brown to the road to give it some texture. 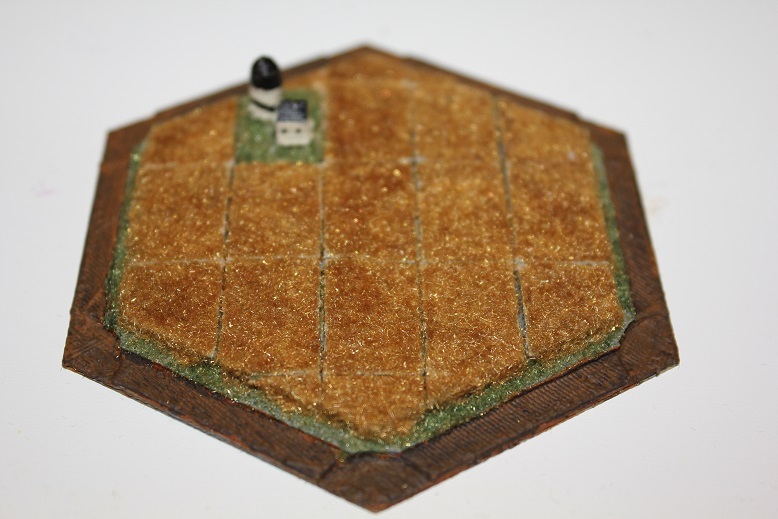 Then I started to do the wheat patches with PVA and light brown flock one at a time, conscious that I needed to be really careful not to fill in the grid with glue. After the wheat area was dry I put on a second layer of glue and fluff and once that was dry I very carefully used a razor blade to open back up any lines that glue had gotten into. Lastly, I painted all of the barns and silos differently so that they were all unique and fancy. These pieces actually took the longest amount of time to complete. The forests were challenging for a couple different reasons. The first reason is that there were plastic spider webs everywhere. It made me think of the scene in The Hobbit when the spiders are taking over the forests… which would have sort of been awesome to keep, but I decided to cut them all out anyway and that was extremely tedious. The next challenge was balancing all of the green that was on the board because the sheep tiles and the brick tiles were primarily composed of rolling green hills. So that is why I decided that it was autumn. This way I could bring some color to the board and get rid of some of the green. Also, autumn is wonderful. I tried to get a bit more color variation in the pine trees but it didn’t work out. These tiles were pretty annoying and I was glad when they were finished. I have to admit that I’m not 100% happy with them. 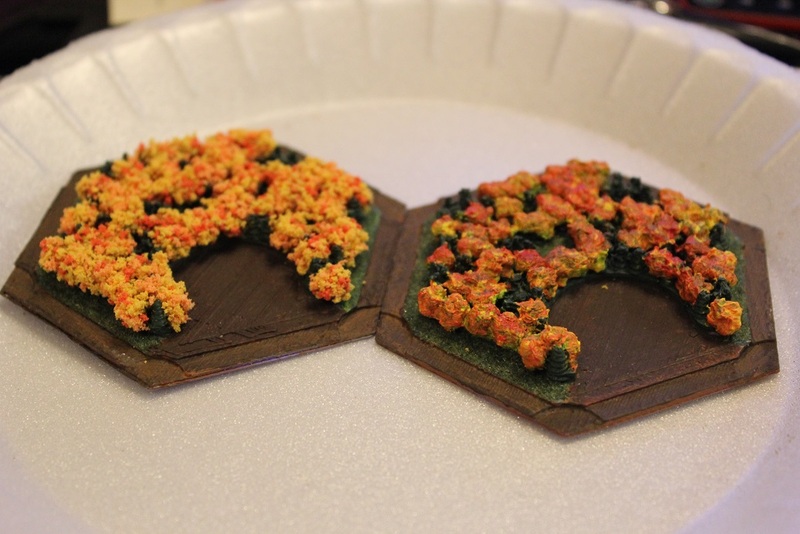 So the run down of how I built up the forest tiles was brown acrylic paint on the road and then green on the grass and on all of the trees. Once the paint was all dry I flocked the grass and allowed it to dry. 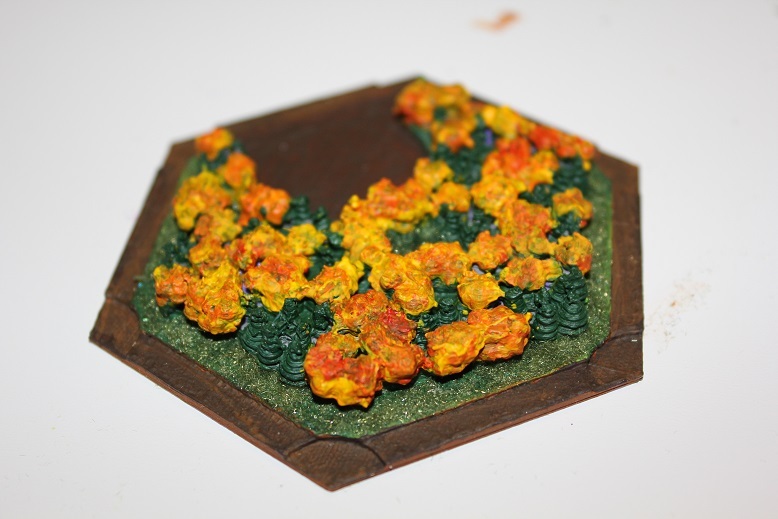 Then I globbed the yellow and red paint on the round trees to create the autumn foliage. Lastly I tidied up the remaining green trees and applied the dry brush to the road. As I was not 100% happy with the forest tiles I decided to invest in some materials to further embellish them and this is how they look now. 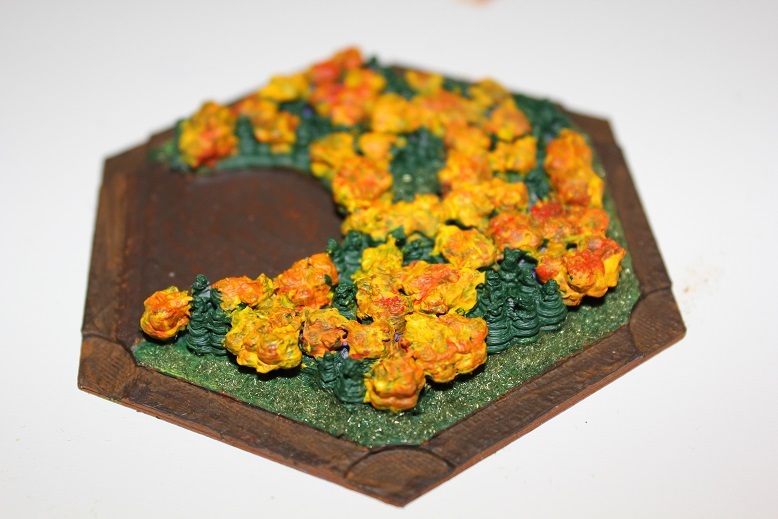 I just tore up some autumn colored clump foliage (for model making) and glued it onto the trees. The texture was exactly what I was looking for. The desert was certainly the easiest tile to complete. 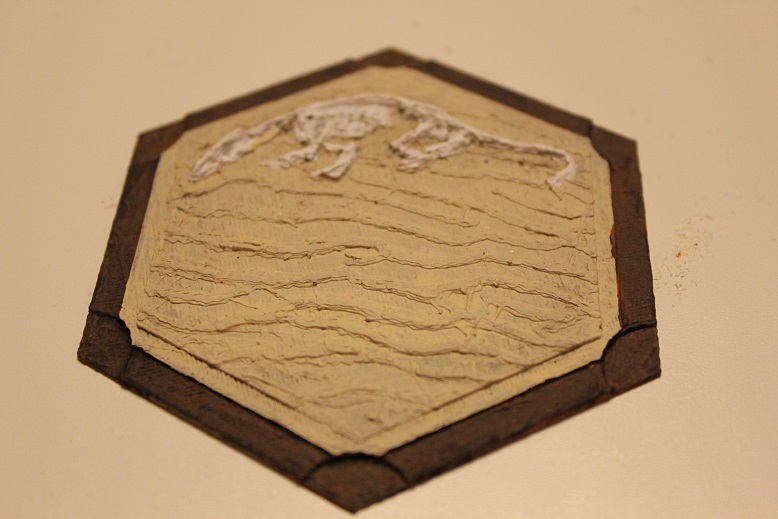 I just painted the road brown and the dessert sand colored and then I used white to highlight the reptile skeleton. I did consider covering this tile in sand but I didn’t have any light or fine enough and flock isn’t really an option since furry isn’t a good look for a desert. 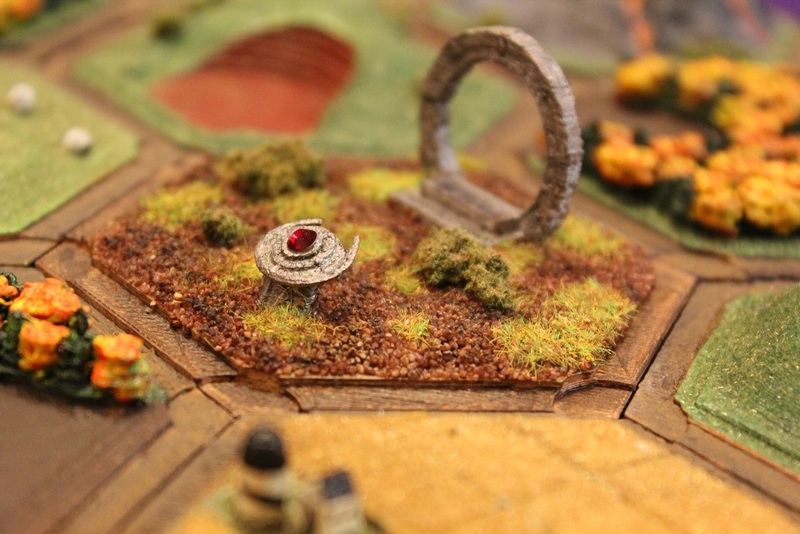 We have now replaced the desert tile with a vastly superior stargate tile. The write up on this tile can be found Here. The brick tiles were also really easy to complete. 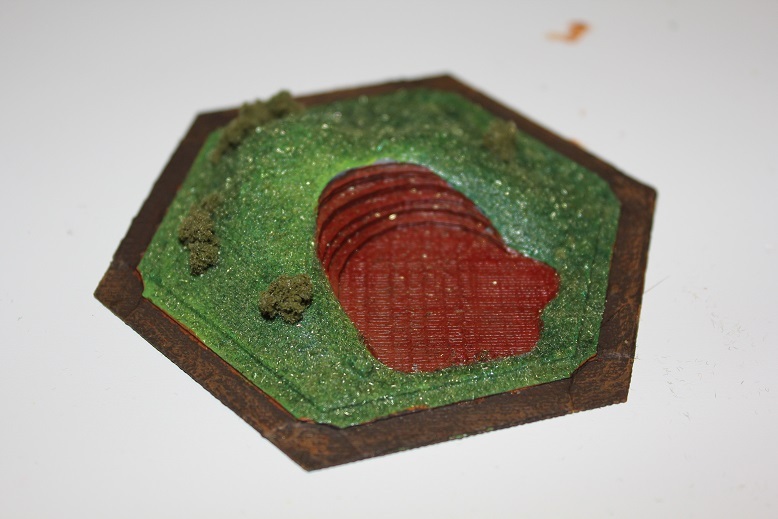 I put on the base layers of paint as I did with the other tiles and then I flocked the hill and stuck on some model bushes. I made the green paint underneath the flock with light and dark patches and these show through the flock which makes it look a bit more life like. 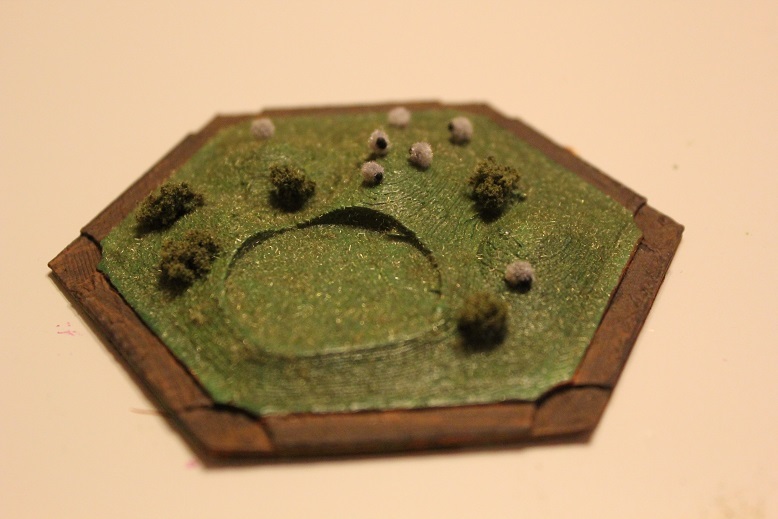 There were little bushes (possibly also sheep) printed on these tiles but I snipped them off because they didn’t print very well with our printer and the model bushes looked better anyway. I considered adding a few sheep to these tiles too but then I thought that during actual game play it might get confusing at a glance with sheep everywhere so I kept the sheep on the sheep tiles. The mountain (ore) pieces were surprisingly easy. I thought that they would be more challenging but the design of the tiles made them absolutely ideal for texture shading. There are three ore tiles and I made them all different. The paint, grass and bushes went on the exact same way as all the others but I did use a lot of dry brushing to achieve the texture shading and the snow shading. 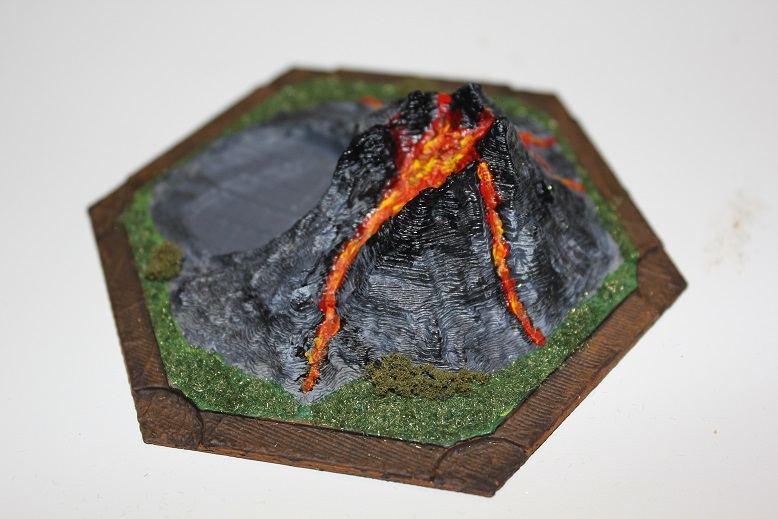 My husband wanted a volcano so I made him one. Not sure how they’re getting the ore out of there but I’m sure the settlers will manage. I made a waterfall on the last piece. This in the only piece that has flowers on the bushes (look very closely) After the waterfall was dry I put some clear nail polish over it so it looks wet all the time. Clear nail polish is an excellent tool for making miniatures look wet! Lastly I’ll tell you about my sheep tiles because they are my absolute favorite. The sheep and bushes that printed on the pieces didn’t come out well at all. This is not the fault of the pattern file but of the printer and our lack of experience using it so I cut my losses and snipped them all off. While the tiles were still being printed I set to work making 25 tiny fuzzy sheep with polymer clay and white flocking fluff. I made them all on toothpicks because it made them a lot easier to flock and to bake. 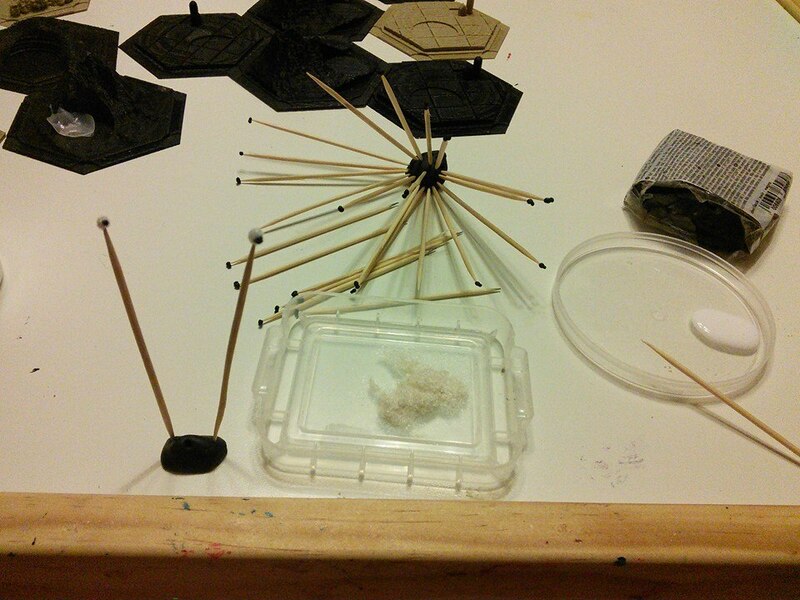 Once they were completed and dry all I had to do was snip them off the tips of the toothpicks. The tiles were composed exactly the same as the brick tiles and after the bushes were all glued on in random patterns I glued the sheep in place. They make me squee with their tiny fuzziness. My only regret is that I forgot to give them some water. 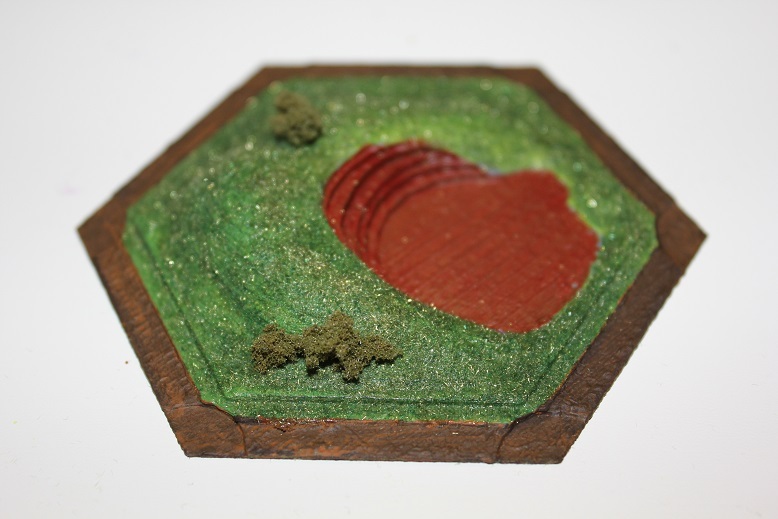 Catan is an island but unfortunately there doesn’t seem to be much water on the land. So that’s the whole set. I now just need to figure out a better way to store them and then I may move onto making new roads, settlements and cities! I’ve also completed four sets of 3D printed settlements cities and roads in addition to Trophies and a Robber! 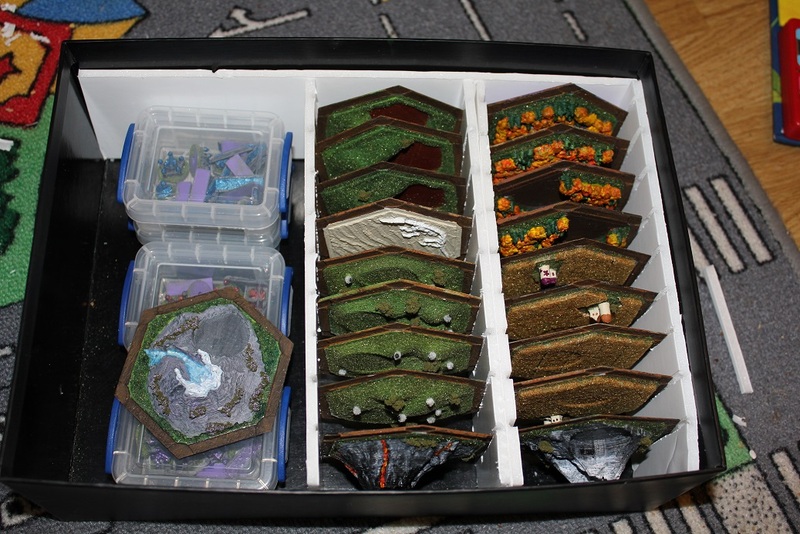 Lastly here is a photo my shoebox storage solution. 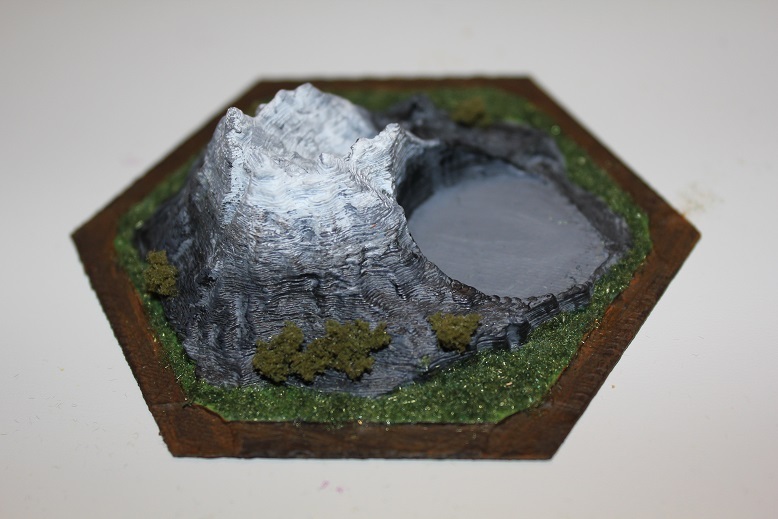 I just made inserts with foam board which enables the terrain tiles to stand up without touching one another. It would be pretty pointless for me to do a write-up on that since it’s fairly straight forward and the measurements really depend on the box you’re using. It took me about 20 minutes to make and cost roughly the equivalent of a dollar. Hello. I absolutely love the detail you’ve put into these. I’m considering building a set myself, with a wooden trim to frame it up. I’m wondering – how do you randomise the tiles when you’re starting a game? Thanks! I have still been debating how to do the edges… if you come up with an effective way, please let me know! To randomize the game we actually still shuffle the cardboard tiles that came with the original set and then use the order they end up in to determine which order the 3d tiles go down. I was thinking of a simple wooden frame, but the only thing is that its hard to design in modularity and keep it simple, say we want to play an expansion. Just found a few game assistance apps on Android – one of them is just for generating maps – looks promising! I’ll be building my game over the next year so I’ll be sure to share the creation. Yeah, we were thinking about doing a sort of inlaid wood frame and had the same concern about expansions…. I think we’ll probably try to do both in time! I’ll have a look for that map generating app! K8200 to print and CURA as the slicer. Have some issues with backlash on the Z axis to fix and retraction adjustments to make. Excellent work! 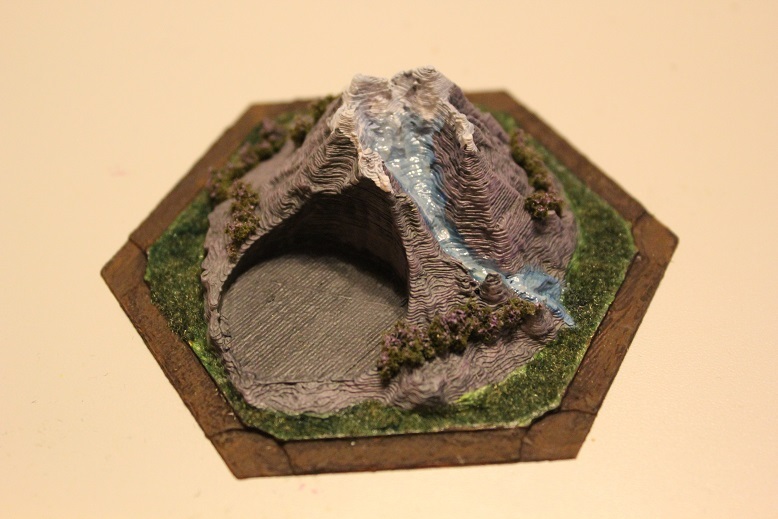 I stumbled upon your site looking for some 3D printed borders but you have now inspired me to print and paint my own set! What brand of paint did you use? Thank you! I used several brands of paint. All inexpensive acrylics in tubes, some watered down to washes. Just a one word – awesome! Really love your work, great respect!